Swansea City have signed striker Botti Biabi from Falkirk for an undisclosed six-figure fee. The 19-year-old has signed a three-year contract with the Swans and will play for the club's under-21 squad. Biabi made 31 appearances for Falkirk last season, helping them reach the Scottish Cup final. He is the third Falkirk player to join Swansea in the last 18 months, following Jay Fulton and Stephen Kingsley. 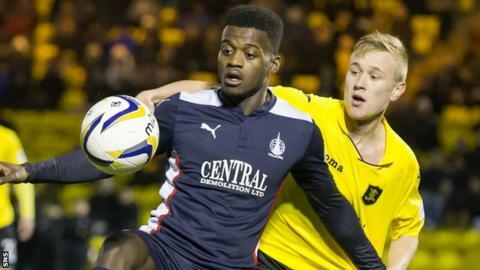 Born in London and of Ivory Coast descent, Biabi made his Falkirk debut at the tail end of the 2013-14 season. In his 31 appearances last season - most of which came from the bench - he scored four goals and was notoriously sent off in a Petrofac Training Cup tie in which he head-butted two Dunfermline Athletic opponents. "I would have liked to have kept him for another season," Falkirk manager Peter Houston told BBC Scotland. "Perhaps it would have been the best thing for him to develop, but sometimes these moves disappear - anything can happen, injury can happen." "It is one of these things. How can you deny a young player the opportunity? "We always say to young players who come to the Falkirk Stadium: 'If you develop properly and big clubs come for you, we won't stand in your way'." Houston stressed that Falkirk did not need to sell Biabi, who has not even featured on the bench in his side's opening four fixtures of the season. "We are in a good state financially," he said. "We are one of the few clubs in Scotland probably that has money in the bank. "Swansea won't see it as a risk, but for us to knock back six-figure fees is very difficult. "Botti's a young and fit lad, very strong, very powerful, a good striker, has bags of potential, still to fulfil it and what Swansea have seen is that potential. "Falkirk are going to get some good money out it and they will make some better money if he produces and gets into the first team and plays first-team matches." Houston explained that former Aberdeen midfielder John McMaster, who scouts for Swansea, had been keen on Biabi for some time. "We visited Swansea at the end of the season there and they probably watched him in one of the games we played down there against them and took a liking to him," he said. Houston immediately replaced Biabi with 32-year-old Lee Miller, who started his career with Falkirk, was released by Kilmarnock this summer and had been on trial with the Bairns in recent weeks.